4x optical zoom lens available while recording video; 26mm wide zoom; Excellent image quality from Program or iAuto; 720p HD videos; Sweep Panorama captures extremely wide and easy panorama images; Great performance; Awesome price tag of $179 US or less. The Sony Cybershot W350 is an excellent entry-level, ultra-compact digicam. Sporting a 14-Megapixel imaging sensor, Carl Zeiss 4x optical zoom lens, Sweep Panorama and 720p HD video capture, this tiny camera is loaded with all the features of larger models. Read more in our Full Conclusion. Sony's new Cybershot DSC-W350 ultra-compact digital camera is loaded with more useful features than a camera this size should hold. It sports a 14.1-Megapixel imaging sensor, 4x optical Carl Zeiss lens, Optical SteadyShot image stabilization, Sweep Panorama and 720p HD video capture, just to name a few. The wide end of the 4x optical zoom reaches an extra-wide 26mm, allowing you to capture vast landscape images or large group portraits. If this is not enough, Sony's Sweep Panorama mode allows you to capture images with a 268° "sweep" of the camera either side-to-side or up and down. 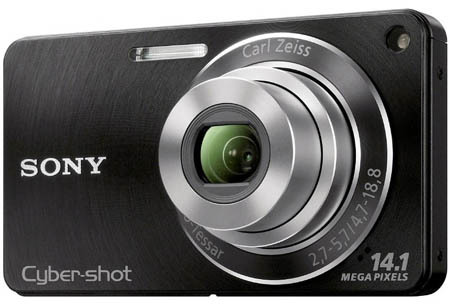 The Sony Cybershot DSC-W350 is available in four colors (Black, Blue, Pink, and Silver) with a MSRP of US $179.99.